Over the last few months I have been exploring the museum stores and collecting my own little cabinet of curiosities. Each day over the next forty days I will choose an object from my collection and offer it up in a spirit of sacrifice. The object will be announced through a variety of media, including this blog. I will then destroy it. This destruction will inevitably take place unless someone cares for the object. Anyone who cares may show that they do in whatever way they choose. Recognized experts and potentially interested parties will be specifically invited to contribute their views. Manchester Museum curators and staff are also welcome to share their expertise, but all responses will compete in a transparent public forum. In the absence of some positive appreciation of the object – a poem, a video, a child’s drawing, a scientific assessment, etc., etc. – I will assume that it is of no value to anyone and should no longer take up space in the archive. Although objects will be revealed one by one, the fate of each object will remain open until a clear consensus is reached. The most beautiful appreciation or cogent argument will be chosen by general agreement. Stewardship of the object will then be transferred to the respondent who may decide to return it to the Manchester Museum or some other place. Here is the first object: a human skull. Human skull of unknown date. Some people believe human remains are spiritually important and others believe they can be treated as museum exhibits in the same way as a pot, a sword or an arrowhead. The skull might be from Everage Clough near Burnley, but we don’t know for sure. This means it is of little scientific value. Is there a case for disposal of these remains? The skull may not be of scientific value, of no known origin, and of very little use to Manchester Museum or any other. Once that skull was a living being, so if it is to be disposed of we should give it the same respect and dignity as we would with any other human remains and find a suitable resting place for the person that was. ‘Destruction’ is a very emotive word for museums, because one of their main roles is to look after collections for future generations: they are society’s collective memory. So for any museum — including the Manchester Museum — recklessly to destroy something is unthinkable. What the Hermit is doing is to challenge all of us to think about why we hold large collections in museums, most of them in stores out of sight of the public, while we seem to tolerate the destruction of natural habitats and the extinction of species out of sight, out of mind. I interpret his challenge as provoking us to have this debate, and to appreciate what we have now, whether they are museum collections or the world’s biodiversity. While ‘destruction’ is a difficult word for museums, many have begun to review their collections to assess their significance and to challenge the idea that all collections have to be retained in the same place for all time. Some museums have transferred material to more appropriate museums; some have returned items to communities of origin (such as human remains to indigenous people for whom they have a deep spiritual significance), and in a few instances, items have been disposed of through destruction, where they have deteriorated beyond repair, or are hazardous, or simply because they are of no significance to anyone. As someone who loves museums and has worked in them for all of my career, I am confident that at the end of this process there will have been a huge public response making the case for the value of museum collections. I am looking forward to the debate! Museum’s collections are not in antitheses with destruction or disappearance. Many, if not the majority of the objects held in Museum’s collections are relics of extinct cultures or species. The notion of memory also assumes a different meaning in museums. Memory recalls an accretive process where the history of an object accumulates with its use by one or more persons and through generations. Artifacts are frozen in time instead, like in a photograph, preserved from the transformative process of an object into memory throughout its use. Eventually the object will be worn out and a replaced by a narrative, a story. In museums objects are preserved for the benefit of cyclic interpretation like samples used in laboratories. Memories are being generated on the spot; they are not an attribute of the object. They take form at the discretion of a curator or an exhibit developer depending on their discreet sensibility and the ethics that characterize every cultural period. Memory is not a permanent quality and cannot be stored on a Museum shelf, so much is forgotten because not longer interesting, like the identity of the person that once the skull was, for example. I’m running a project at the moment on heritage connections between Japan and East Anglia. A controversial figure in this story, John Corner, wanted to protect the collections at Raffles Museum and the Singapore Botanic Gardens following British surrender to the Japanese. Looting, by whomever whenever, could destroy a century of work. To this end, he requested permission from the British Governor of Singapore to write to the Japanese authorities just a few days into the surrender. They agreed, and he then worked closely with a small group of British, Chinese, Malay, and Japanese colleagues from 1942 – 45. Their efforts to preserve small insects in bottles, books, maps, dried leaves, you name it, was astounding in the circumstances despite lack of resources and suspicion towards this group from other parties. It is deemed on reflection, that he placed international scientific co-operation before national politics, but his decision remains controversial to this day. His grandson, with whom I am working at present, said his grandfather’s house was like an Aladdin’s Cave, he could never throw anything away. This was true of many veterans of that time. Will we get the hermit’s wife blog at some point? I got a bit of a shock when I saw the photo of the skull and realized that it was the first object to be considered for destruction. I guess you could say that it is literally my job to ‘care’ for the skull. It goes without saying that museum curators are deeply committed to handing on the collections for which they are responsible in as good a condition as possible for posterity. No-one destroys museum objects without proper consideration. However, some objects in the collection have little associated information and their scientific value is limited. In these cases it is only right that disposal should be considered. The Museum has many objects and it costs money to house and care for them. Although the skull is recorded on the Manchester Museum documentation system as coming from a site called Everage Clough near Burnley in Lancashire, the site excavation report and the Historic Environment Record make no mention of human remains. It would appear that the skull was attributed to Everage Clough in error. This skull has an illegible old label so we don’t really know where it comes from. If we accept that is the case and the skull has no locality or find spot and is, therefore, of limited interest for scientific research, should we condone destruction of the skull? I think there is a case for disposal of the skull but I believe this should be done in a sensitive and respectful way. The Manchester Museum’s human remains policy and the work we did as part of the Lindow Man project, emphasize that human remains are not in the same category of object as say a pot, a flint arrowhead or a sword. Some people think that human remains retain spiritual and religious significance and that we should treat them sensitively, whether they are in museums or hospitals. In the interests of transparency and accountability, it is right and proper that the Museum listen to people ‘out there’. How you define sensitive treatment is a moot point but at the very least it would involve consultation with the community about which human remains are to be selected and how they should be disposed of. One way of disposing of human remains is to rebury them and ideally that would be agreed with the community as part of a consultation. The Museum is committed to doing this anyway as part of a larger project focusing on the human remains collection. So I would argue that Ansuman should not destroy the skull, not because it should be retained indefinitely by the Museum, but because sensitive, respectful and ethical treatment of human remains demands that we consult with the community and that the method of disposal is acceptable to community representatives. At the moment the consultation is limited to those who happen to read the Blog. We need to respect due process for consideration of the disposal of the human skull. What a wonderful project you’ve embarked on. I’ll for sure read your blogs on your thoughts and contemplations during these 40 days and 40 nights in isolation. On the matter of human remains, I feel that human remains are sacred and should it come to disposing of them, I suggest the skull that you found be buried. All the best. This is a very beautiful, well formed skull, with a nice blue-green patina. It would be a shame to destroy it! I personally don’t like museums keeping human remains, especially showing them off in exhibits for all to see. I think this is very disrespectful, so I wouldn’t mind it leaving the collection, especially if it has merely been gathering dust. Judging by the response of its curators, they don’t see the point of keeping it anyway, so maybe it should be replaced where it was found (if those people can even remember where they pilfered it), with proper ceremony and respect. Please take good care of it! Um, can you really ‘destroy’ a human skull? Surely you should bury it, burn it, say some sort of rites over it, mourn its passing, because whoever the person was that passed – surely that someone, once, was loved, was someone’s child, was more than just dust and bones? A skull isn’t just any old rubbish. It’s precious, no matter how old and unloved. Look up artist Christine Borland and her beautiful painted porcelain skulls; the work ‘explores life, death and how social systems and institutions exploit and devalue life’. She uses skeletons in many of her pieces, attempting to personalise that which is depersonalised by the medical (amd perhaps museum?) profession. I’m surprised no-one has mentioned Hamlet yet; perhaps we should name him Yorick? My quandary has always been how one ascertains the difference between coming across an artifact and coming across a burial site. How do we determine when we remove an artifact and disturbed a grave site? One of the problems we have is that we simply don’t know where some of the objects come from. The information may not have been there to start with or it has been lost since (remember that it is only since the 1980s that museums have had computerized documentation systems). Institutions exchanged specimens (often those for which they had little information anyway) and the precise locality was unknown. I have in front of me an ancient index card that refers to an exchange of material with a Professor Lebzelter of Vienna in January 1936. The Museum received 12 “Central European skulls”. Presumably the skulls came from an excavation but we just don’t know the original circumstances of discovery. We don’t even know if the skeletons were preserved. In the 19th century it was common practice only to keep skulls and long bones and rebury the rest. If we don’t know where things come from it really does beg the question of how useful they are for future research. But if the decision is to dispose, I agree with others, the skull should be disposed of in respectful way. Sorry, but I can’t empathise that much with a skull. Am I the only one that thinks that bones is, well just bones … To me it is what went on in the head and heart that matters and this shell leaves us no clue of that. Better off back on the ground where it can contribute some minerals back to the earth. Please treat the skull with respect. If it cannot be returned to the original site where it was found at least bury it somewhere peaceful and quiet where it won’t be disturbed again. I think your photo of the skull is moving in itself, especially the contrast of your skin and the skull. People have always found skulls strangely fascinating, I guess because we see our own inevitable fate reflected back at us. I think it should be respectfully buried. There are some interesting comments already! Initially, I was a little shocked that this should be your first object, but then again it’s evocative and has certainly started the debate, so may be a good choice. The irony has not escaped me that, as an archaeologist, I ultimately detroy that which I seek, as the process of excavation and evaluation usually damages objects more than sitting in the ground all those years. Nowadays much more thought is given to considering how finds will be stored and archived but our Victorian forbears collected and exhibited without regard for constraints on museum space in later centuries. The cynic in me can see that museums need to de-clutter as much for financial reasons as any other. However, your project is certainly not a financially efficient way of doing this, but more akin to a mental excavation of the museum. And you would be surprised how many significant archaeological discoveries were made in museum stores (e.g. Gilgamesh, part X). This is of course also an argument for keeping items, as you do not know what information might be gleaned from them in the future. Then again the beauty of de-cluttering is that you free up space for new things and the remaining objects can shine again in a different light. So, what to do with the skull (or indeed “Yorick”)? Yes, it is sad that so little is known about it, that the label is eroded and, worse still, that no-one seems to see any value in it. Does this lack of information really devalue it? Or could we see this as making it more valuable for stirring our imagination? Can we be sure that future generations will not want to to DNA test it? How would we want our own remains treated? This is not just an object, but still part of a person who once lived. I do not think that we can just ignore this intrinsic value and most of the comments so far seem to support this. Personally, I would hope that a good home can be found for it, maybe even a new purpose. Is there a young archaeologist outreach programme at Manchester Museum? Could it be used there? Surely, we cannot in good conscience dispose of it unless we can be sure that we do not want to keep it (and nor do our descendants) and we have made a good effort to try and find a new home for it. What a though provoking project, dear Ansuman. I wish you a happy time of reflections. makes it harder for archaeologists to argue against the metal detector fraternity..
go and get a worthwhile job helping people. 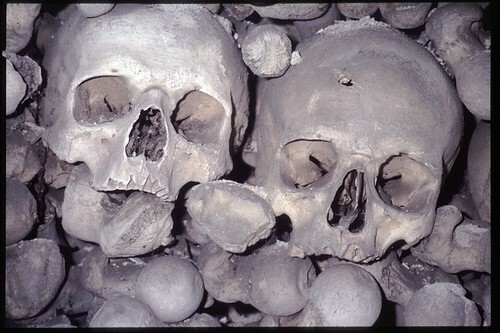 Leaveitalone: so should the skull and the other 4 million objects be left alone forever, squishing up against one another as archeologists and their peers add more and more to the collection, except for the occasional lucky object chosen to resurface once in a blue moon? At what point do we shed stuff? How do we assign value? Personally I think the skull is in luck. It’s seen daylight for the first time in decades probably. What would I do? Get the hermit to lower the skull on a rope out the window in the night to a tipsy passer by. Cause a stir. Create a scandal. Make it’s story live again. Get a wider range of people talking and blogging, thinking, debating this brilliant project. And then give it to a school and challenge them to create and lead an appropriate cermony and choose its final resting place. If i had been the wearer of that skull, i’d be proud. A Reply to the above comment …why do you think the project is a ‘pretentious self-serving pseudo-art project’? Conceptual art does not necessarily produce a canvas or sculpture (if that is your complaint), but it does encourage discussion and debate on significant topics – your response and reaction to the topic confirms this. We need public debate on the future of museum collections; far from giving museums a bad name, surely its putting the discussion into the public arena? As an artist, Ansuman is acting as a mediator between the public and the Museum’s collections. Are you suggesting an artist has no right to comment on the topic? The artist does not make an issue ‘harder’ to solve, as you suggest. The more voices, the better. I am currently a PhD student studying unprovenanced objects from Egypt and the Near East and was actually horrified by the idea of destroying an object because we don’t know much about it! Surely the name of the game in archaeology is to extract as much information from it as possible? The provenance is just one, rather limited, aspect of an object. It is of course important but not the only useful piece of evidence. Just of the top of my head (apologies for the pun) has anyone tried to analyse this skull in the context of others i.e. compare cranial measurements? Has anyone done any reconstruction work to see how the person may have looked? You could always re-bury the chap! In fact is it a chap or chapette??!! Actaully hand it over to me now, I’ll look after it and go and do this work myself! Does the skull belong to you? Is it yours to destroy? I’m not sure I like the idea of someone finding someone else’s remains and then having control over what happens to them. If in 200yrs time a museum finds MY remains somewhere of interest, then I’m very happy for them to do something interesting with them, but to just take them away, put them in a dark room and then decide to destroy them altogether? Do you have the right to do that? I think you’re probably over-stepping the mark here. Plus it’s a bit wasteful. You’re the guardian of these artifacts – if you don’t want them, find someone else to take care of them. Dan seems keen. Or just put them back where you found them. Easy. It has symbolic power and to destroy it would have symbolic power too; as in the Kennard montage. For me, destroying it would be an anti-human act. To find it a new home – would be preferable. Perhaps the museum isn’t the best place for it. hope are enjoying your stay at the tower! strangely enough i have just found a cranium in the basement of our basement and was wondering what to do with it as well! i am thinking of getting a DNA test done to figure out who it belongs to – would that be worth doing with your skull? i am finding the cranium quite interesting as an object and would certainly like to use it but am not sure how or where. i would keep your skull if you could find out where it came from because otherwise it is pretty pointless. enjoy your stay and look forward to hearing more of your stay at the tower. As a Buddhist contemplative of some years I find myself joining with the Manchester Hermit and his task and see merit in what is being pointed to through this project. The skull was, in my view, an important first choice. This form brings home, in a disturbing way, the ever present truth of impermanence. A truth we encounter moment to moment yet only when faced with loss, a death perhaps, does it come home to us personally. Bobbing along, as we do, on the river of changeableness there is the ever present matter of choice. On what do we base our choices? Does the contemplation of the crumbling moment show us something helpful about ourselves, and the way we live? Well yes: and then we make wise choices. I’d like to make a case for keeping the skull, and other human bones in the museum, to be then given into the guardianship of those who have a legitimate claim to their continuing life. A creative impulse has come upon me in the form of a personal letter to the skull. Please understand it’s offered with the greatest reverence and respect. I address ‘you’ personally because my wish is to convey, through this means, that I do not regard you as an object with a problem. Far from it. Firstly then, how wonderful it is to see you being held in a human hand and presented such that many people will see and appreciate your wondrous shape and presence. This form has transmuted and transformed and now…well what is to become of you? Where I come from, during funerals, we address the dead directly. This can be a bit shocking for some however it does make sense. Why ignore the body when, even in death, it seems so alive. You are non the less alive, for being dead! At one time you were connected to a whole family of bones. So the ‘you’ I’m addressing is a whole. And as I go on ‘the whole’ I make a case for is a whole lot bigger than one might imagine. Infinite actually. Let’s, for a moment, remove your object status and contemplate you within the infinitely interconnected universe, where time and space lose their ordinary meaning. Where our dualistic thinking takes it’s rightful place in the scheme of things. The ‘universe without edges’ why not? From here, from an expanded perspective, I’d say this bony structure, your skull, has both practical and spiritual merit which your keepers would do well to contemplate. Yes, I know, keepers and guardians are there to keep and guard and (thankfully) yours seem to have open minds, and hands. You, once connected and animated to other bony structures, spine, pelvis, arms and legs, not to mention that forgotten limb, the jaw, have a job. Let’s get that label off and go to work! Why not volunteer yourself to be out there in the museum for the public to feel and run their fingers across, to be held and appreciated. And to know, hands-on, the truth of impermanence. (No, perhaps not such a brilliant idea!) Or perhaps reside in some other context more fitting. A religious setting why not? There ‘objects’ (commonly distinguished as either sacred or otherwise), are more likely to be regarded equally. Where, out of sight, the so called mundane is sanctified through the inner life of meditation, and through care in living. You might be pressed into service showing people that fine point of balance where the spine connects deep into the skull. A connection so significant for those who sit, head poised on the spine in meditation, and who move about too. This your practical merit? To aid instruction on simple body mechanics in order to help people sit and move about with greater understanding. Not a bad job really. What’s to do now? This is an ever present question, to asked of ourselves in the quietness of contemplation, moment to moment. This is your spiritual merit. To remind us of impermanence, to appreciate and accept this ever present truth, and to make wise choices in the light of it. That’s a permanent job! The long and the short of it is, I’d be glad to take care of you. No sticky fingers running over your pate! Just respectful, thoughtful and reverent touch. Think about it. A friend and fellow traveler. why don’t we auction the skull? there might be someone out there who wants this skull? that way it is preserved and the capitalist economy is bolstered! The trouble with the word disposal (or indeed, destruction) for me is that I would consider an ‘object’ for disposal, but I do not consider human remains to be ‘objects’. They are people, whether we know who they were, just their names or nothing more than their presence in a store, they are people. When I die, I understand I no longer have a right to vote but I do not believe my being dead will make me any less of a person. Perhaps that is why the word dispose is such a taboo in this matter, for me anyway. I would personally be very reluctant to destroy human remains. Who knows in the future what these remains could lead to. As Bryan said, in the beginnings of archaeology common practice was to dispose of ‘excess’ bones. Perhaps this person has already had their remains dissected, selected and disposed of by another living hand. In the future many things that we can not yet do may become commonplace practice. If the human remains are destroyed we may be destroying an important piece of information – whether we know it yet or not. We may indeed be destroying pure potentiality. Ethically I believe the skull should be reburied, preferably without applying any ceremony too specific. I believe it would be worse to apply a belief structure on an individual we know nothing about than it would be to destroy it. This is a person, not a human skull (artifact). Burial/re-burial is therefore the only ethical or spiritual option. A case of death, or case that contained life! Look – Deep – But Nothing! All that was is nothing! Irony is the structure now! Or glimpse just one strange sight! This precious posession that once posessed thought! That calcified shell that counts no more! It was a person once and therefore the debate around the human skull depends on it’s value and the ethical application of that value. I see your point. But for me, it’s not who it was, but what it was and what it represents. Yes it’s somebody’s skull. If that skull belonged to Hitler, I wonder what the reaction would be. But it’s not about the person, it’s about the life. That somebody once existed. As an atheist, that person does not exist anymore, anywhere, in any form. But I do not feel that this skull is unimportant, or not valued in any way. It represents a person and their life, and then that person and their life ending. It is no more or less valued than old stones that make up an old building, or a book. It all represents life and death – and this is the single most common thing every human being has with each other; with those who have gone; and those who will come and then go. This skull is relevant to every one’s life, death, and what will remain after. But… Have the respect to let the dead be dead and honour it as a once-was? Well that depends on what you think you’re respecting and honouring, and if you think that is what the person that once was, would want – or if it’s just a reflection of what you would want, what your beliefs are, and your position in life and death yourself. My thoughts that it brings are – Who wants to be dead? Worse, who wants to be dead and forgotton? I am a self professed thanatophobe in that I cannot come to terms with the inevitable ceasing to exist that will be upon every single one of us; and those who have already ceased from existence. We spend our lives thinking we know how precious life is but do we… Really? Destroy it, and we might forget about our inevitable fate, or pretend that we don’t care and it isn’t relevant to us? Or destroy it, and it may remind us of our fate, the preciousness of life and how this skull is relevant to us? The latter could be one interpretation of such a provocative act. The fact that it stirs a debate is the important part. Controversy makes people think and then talk, play with ideas, and to me, it brings our consciousness alive. But, all things considered in my last hour of pondering, I think not destroying it, studying it, appreciating, or burying it, is relevant and important to those who are alive and who want to fully appreciate what it was, is, and how this relates to them personally. For the person that once was alive and housing the skull, we will never know what is ‘respectful’ and ‘ethical’ to that person at the time of death. So whatever happens to it, we’re not likely to get ‘respect’ right anyway. Just likely to impose our ideas onto this long gone human. The space between me and that skull has caused me some personal thought, reflection, feeling, and given me a few moments of ‘life’. The skull represents a death, a ceasing to exist and that’s important, relevant and valued personally, intellectually, and spiritually. To destroy something that is intrinsically harmless is an a provocative act of aggression that is offensive, at least, to me (and personally harmful to the destroyer?). I think the only ‘destruction’ that should occur, should be by the passive disintegration of the skull as it recombines with earths essential elements over time. In the ground. I think Lisa makes a very thoughtful case here for consideration of material like human remains in teaching the public about death. Probably the only time we encounter death is if we have the misfortune to lose a close reative but in Victorian times for instance it was a common occurrence because of disease or accidents in the workplace. The Hermit project has clearly succeeded in stimulating thinking about a range of topics. And I agree we don’t know what would have been deemed sensitive or respectful for the individual, we can only do we think is respectful. The best way of defining respectful treatment is to ask the community what it thinks is the right way to treat the material. So when someone says destruction that could actually mean reburial or perhaps cremation. It would depend on what the community felt was appropriate (as when human remains are repatriated to an originating community in Australia, New Zealand, the Americas or elswhere). There was an article in the Museums Journal recently about the discomfort caused when museums enquire about material they have repatriated to these communities. It is up to the communities to decide what to do with the material. The important thing is that the museum in question is not taking these decisions unilaterally but involving the public in the process. That has to be a transparent and fair way of proceeding. With all due respect, Bryan, this statement struck me as being uncannily naive for someone as intelligent as yourself. Have you not seen the news lately? The obituaries? The stats on AIDS, cancer, crime, famine, war, the myriad new diseases premiering each year and defying antibiotics; the way thousands upon thousands of different animals are slaughtered for food and pelts or because they inconvenience us, the way the elderly slip away; the way that some babies don’t make it out of the womb alive? Death is no less “common” now than it was before. It might be relatively postponed for some, via cryogenics or good genes, but last I checked, no one gets out alive, not even an android is exempt from the fact of decay and eventual breakage. There is no unchanging entity, except perhaps the space in a vacuum. Each of us is making our way steadily toward death with every passing breath. Look at yourself in the mirror and compare with age 1. In the Buddhist traditions one of the primary meditations is to contemplate the fact of one’s impending death, not in order to become depressed, hopeless, miserable, and useless, but to live with more encompassing awareness, universal responsibility, and sensitivity. How is it that we miss this again and again? Feel that this is everyone else’s fate except our own? The magic key to your life is recollection of death. Everyone should have a skull sitting on their bedside table. Great way to restore perspective. I am a Buddhist monastic living in a monastery. In one of our common rooms there is a scull, a plastic one. It has the same message as an actual human relic. Life is imperminent, live life well. Be the best person you can be, now. Early on in the debate about the scull I offered it a home, here in the monastry. The offer still stands. Everything is respected and treated appropriately. Obviously the person who was is no more, however the merit of that life can continue on (where-ever that might be) to teach all who encounter the trace of that life, about living now. Bryan, I agree with your comments and I am glad to read that there is some human respect in terms of what lies in museums and what happens to those after… that ‘destruction’ may mean cremation or burial, and that your view is that it is important it is a decision for the community to make. m. e montenegro and Reverend M., I think you are touching on what I was getting at but perhaps worded more clearly. That it is about taking all death as personally relevant, and not living insensitively to the ultimate truth of all living things and their inevitable death and the importance of living well. The world would be a much better place for it if everybody could be in touch in this way. But what about every single skull? This skull in particular could find a home in your monastery, Reverend M. However, I would be interested in what your view is on the wider subject of the number of these remains in all museums. Similarly, m. e montenegro, I like your point but are there enough bedside tables in the world to home all of them? This is why my view is a respectful putting in the ground, or in agreement with Bryan’s comments, what the community deems respectful. In terms of universal responsibility, I completely agree. And the reminders are equally important. I saw a dead baby fox the other day and I found myself standing by it thinking about this topic. I wondered whether I should do something for it, but upon pondering I decided it is already on the grass, it will disintegrate and nature will take care of it and life will continue and benefit from it. What I found disturbing was that it’s tail was cut away from the bone. It’s something hunters do as a souvenir, I hear. How unecessary and unkind. I think that whoever took it needs to be offered the skull by their bedside table by sending a copy of these discussions with it. Might provoke a little thought on what is important and how their behaviours are governed by that. It’s funny recently I got an email from a friend who asked if I would opt for cremation or burial. Now that I have entered my forties it’s something I am not so cavalier as to ignore. Ultimately, what’s socially responsible now is what’s sustainable. How sustainable is burial? Why use a tree or other materials to make a box to hold a corpse? This view of course is anathema among some who feel it’s an insult to their creator to cremate a human corpse after it has become non-sentient. In Tibet most human corpses were either cremated or cut up and fed to the birds. There is an expression in Tibetan about corpses: a corpse is like a hair in butter (who wants it)? The consciousness that animates a body, being formless, is what makes the matter of the human body meaningful. I hope I don’t need to defend that observation. Once that consciousness has disembarked from that body, that body can no longer be said to be the person it once was, unless you believe that the person equals the body, in which case the logical entailments are endlessly silly: if a person is the body, would it stop being a person if the arms and legs were missing? What if the person had a heart transplant who is it then? Etc. The debates opened by this blog are indeed compelling: how and what do we value? And why? Perhaps we need to reflect on how we should understand and relate to the everchanging nature of form, and what mental attitudes are helpful in dealing with responsible creation and inevitable (as opposed to harmfully intended) destruction. If we ascribe some objects as implicitly sacred and not others, sooner or later we will come up against the glaring ethical dissonances in our views. As I write this hundreds of thousands of people are perishing in many countries of the underdeveloped world. Thousands too in wars; the mortality rate in those places being comparatively higher than in so-called developed nations. Is anyone running there to protect and preserve skulls? Needless to say, most of us are not even running there to protect and preserve life, much less the sorry evidence of grotesque and indeed inhuman(e) imbalances. I really appreciate this comment. And at the same time I could see your monastery as the ideal home for such a relic, if its destruction is deemed out of the question. In Buddhist monasteries, skulls are meant to inspire, as you point out, total presence, and the will to be the best person you can be, now. Thank you. As an icon of the stripped-back essence of a person, it’s difficult to do better than a skull. Once you’ve removed all the protective covering of race, class, and personal accomplishment you are left with the feeling that despite our dazzling complexities, we are all essentially the same. Maybe the discomfort with the nameless, un-labelled skull is a symbol of our wish to classify our world. If we don’t have a place for it, surely it’s better to get rid of it than upset our carefully devised arrangement? If it has no place, it must not have a purpose. If this is the case for the deceased, is it also the case for the living? I agree wholeheartedly with Katy that deep down we are all essentially the same. Where I’d disagree is in extending the argument to get rid of things that apparently have no place to living people! There may be a misunderstanding about what classification means and practical questions such as, Is this specimen ever likely to be used? Does it have research potential (this is particularly relevant within the context of a university museum)? If not, how do we justify keeping it because all items have storage costs (lighting, heating, security, etc). The Hermit project usefully raised a lot of questions and started discussions that people who work in museums have been having – but in the public realm. So I would say it’s not about disposing because the skull doesn’t fit a classificatory system but because without a provenance the research potential is very limited. As an example of this, I was surprised that the same students who say they would gladly take the skull, actually show no interest in unprovenanced (i.e. without a locality) material when they come to the Museum to carry out research. Re. M.E.Montenegro’s contribution, I was of course referring to people’s direct and personal experience of death rather than the deaths experienced via reports through the media. You may object and say that we should show the same concern for the loss of life from disease, war and other causes as with the loss of a family member but (without wanting to sound utterly callous about it) human beings simply don’t work that way. A glance through any Victorian newspaper for example, shows it was fairly common for people to die in accidents in the workplace or in the street, say run over by a cart (doesn’t that happen in the Forsyte Saga?) so most people did experience death in their everyday lives. That doesn’t happen today. Perhaps car accidents are roughly comparable but for most people (excluding the emergency services, hospital staff, the armed forces, etc) direct encounters with a dead body will be limited to the death of a close relative. That being the case, there is clearly a role for museums and other institutions to educate the public about this issue using material from collections. The Manchester Museum’s Lindow Man a Bog Body Mystery explored the different meanings that a 2000 year old bog body had for a range of different people, including a forensic scientist, museums curators, archaeologists, a member of the Lindow community, peat diggers and a pagan. For the latter contributor, the body was important for spiritual reasons, as an ancestor, as a direct link with the environment and a reminder of the human condition in which death is a perfectly natural part of the cycle. All of these were valid and interesting responses and they were just a selection from what might have been gathered. An orthodox archaeological interpretation was on offer but was not the only way of understanding the body. Inevitably the body of Lindow Man or the skull can be seen as a memento mori. I too was referring to people’s personal and direct experience of death. Whether the death of people unknown to us along with our awareness of our own steady movement toward death, is personal, that is, informs or affects us personally, simply depends on whether we can perceive others as not that different from ourselves. And what could be more of a direct experience than noticing the changes in our bodies from day to day? We are just not particularly interested in general in reminding ourselves of the truth of impermanence and the uncertainty of when we ourselves will be the ones dying. We’d rather relegate death to the “other,” painted on screens and newspapers; something that surely won’t happen to me or at least not today. Thus we postpone tapping into our depths. You say humans don’t work that way. I agree, most don’t. It’s certainly not something that is taught us in the present conventional curricula. I have been fortunate to know quite a few individuals, however, who do work that way. And I feel we could all benefit from that sustained exploration. But we see what’s outside our skin and subjective sense and mental awareness as being radically other. Optical illusion. An illusion that as Ansuman has elsewhere stated, is unsustainable. Taking one human skull in order to start a debate risks attention being focused upon that one human skull, when perhaps we might allow this individual to remind us of the many ancestors whose remains have been disturbed, exhumed, stored in boxes for, in some cases, centuries. As the hermit here provokes debate, the Manchester Museum debates what to do with the many human remains it holds in its collection. As it does so, I sincerely hope that it takes into consideration a sufficiently inclusive view of what its duty of care entails. We may not know where this skull comes from, or who he or she was when alive, but we do have a fairly comprehensive and shared understanding of how our society now expresses respect for the dead : unless there is clear consent given by the individual while living, we lay their remains to rest, in peace, undisturbed. We might debate the purpose of a museum, but I suggest that its role is very much about education. Perhaps we might consider that, if the museum does anything other than express the above level of respect for the dead, surely they have failed us in their role. There was a meeting about a fortnight ago to discuss the responses to the objects used as part of the Manchester Museum’s hermit project. The minutes have just been circulated. So far as the skull is concerned, there were interesting comments around reburial. The skull will be considered later as part of the wider ongoing consultation over ancient British human remains. We also discussed the tooth. As human remains these will be considered later as part of the wider on-going consultation over ancient British human remains.